For the last week of our engagement month, we’re happy to ring in the holidays with a few ideas for recreational activities for the workplace. Employee morale is not naturally at its highest at this time of year, as it feels like the stress of the past year has piled up a bit. Also, many people might be preoccupied with holiday plans, especially if they include travel. So, it is always a good idea to have some workplace events and/or activities to get people excited and driven during this season.You might be thinking you want to forego or add to the traditional annual office party. So, here’s 4 ideas to get the ball rolling on its path to 2019! You might have already heard of Secret Santa, but have you heard of the Yankee Swap? It is also sometimes called a Dirty Santa, a White Elephant Gift Exchange, or a Yankee Doodle. This is a great activity for a small to medium group of people who might only know each other on specific facets (e.g. work). It’s very simple. Each person brings one wrapped unlabeled gift, and they’re all put in a specific place (for example, under the tree). Typically, there is a €20 limit on the gift values. Then, people’s names are picked out at random. The first person chosen gets to pick up a wrapped gift of their choice (not their own), and open it. Then, the second person gets to open a different gift, then decides to either keep it or swap it with the opened gift. And so on, the gifts are distributed over the group. Keep in mind that the first player doesn’t have a gift yet, so they will come in at the end and have their choice from all the opened gifts, screaming “yankee swap” if they end up not choosing the gift at hand. A lot of workplaces have their own permutation of a “Casual Friday”. My freshman year geology professor had a “Hawaiian Shirt Friday” tradition for our 8AM Friday classes in -43°c windchill. Closer to certain holidays, she would customize the day’s theme to fit the holiday. Needless to say, it was an unforgettable tradition that I went on to cherish. Ugly holiday sweaters have somehow come to be embraced by different brands. 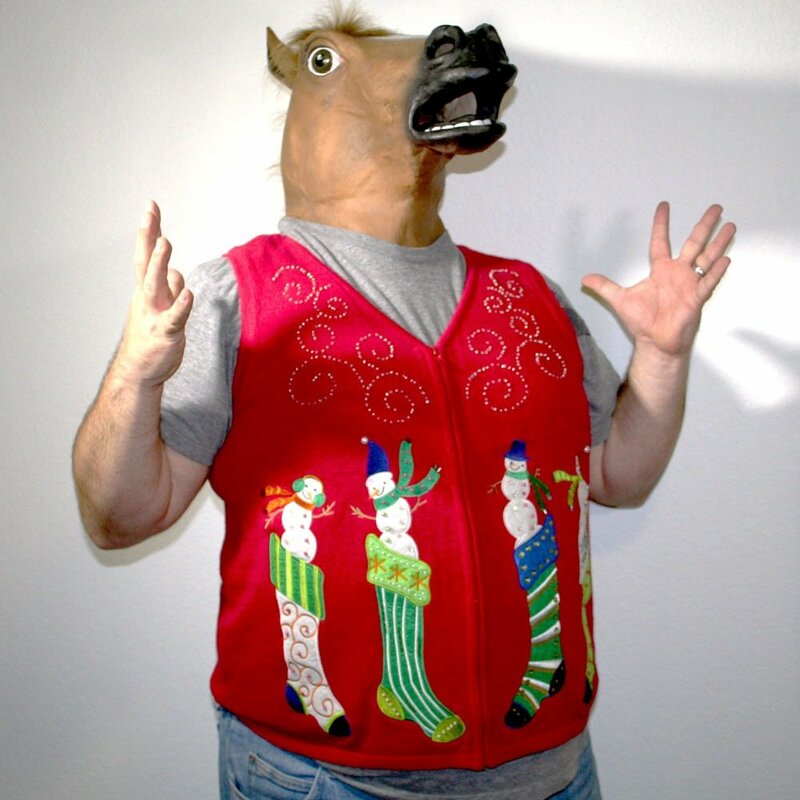 So, whether or not you have one of those Friday traditions in place, consider throwing an ugly holiday sweater day where your employees would dress up in their favorite ugly holiday sweater. Key word: ugly. You might even add a fun twist to it and have everyone vote on the ugliest sweater. Or, if there is a shortage of holiday sweaters, you could order them in bulk, sell them with an appropriate markup, and donate the proceeds to a charity. If your work in divided into individual or group stations, it is the perfect place to introduce some healthy holiday rivalry. You could have employees decorate their windows, cubicles, or their desks to kick off the holiday spirit earlier in the season and to lighten up the moods. Toward the end of the year, you could have different departments judge each other and the winning individual or team would get a prize. Ah, the holiday party. It needs no introduction. But, what if, this year, you add a twist to it by making it themed. It could be based on a popular seasonal show (such as The Nutcracker), a certain time period, or a unique inside joke you have at your office. When I was working on the residence halls of my university, we had a Lilo and Stitch theme party. But, since many (including myself) were not familiar with the theme, we also held a movie showing on a different night prior to the event, just to get everyone on the same page. So, that’s two related activities for the same occasion! The possibilities are endless with holidays activities, so these are mainly here to inspire you to custom-make your own. It’s also worth bringing up that these ideas are by no means exclusive to a workplace of one kind. These are still great ideas for graduate student laboratories at universities, social advocacy clubs, or any kind of professional setting that could use the occasional twist! Happy Holidays, everyone! This article is a part of Engagement November: a month-long series on workplace engagement strategies and best practices. Is Toastmasters Right for Your Workplace? Abdulwahab (Abdul) is a internet-of-things intern at Countr for summer 2018. In addition to his development of Countr's hardware solutions, he has an interest in marketing and social media management, so he is eager to showcase this enthusiasm on the Countr blog!